Texas Instruments took in 1976 in conjunction with mathematics educators at two major universities an initiative to introduce a group of 6 calculators for educational use. Including the Little Professor, the limited function ABLE calculator, the colorful TI-1205 and TI-1255, the TI-30 and the sophisticated SR-51-II, these calculators helped students understand and use math concepts from kindergarten through college and career. The TI-1205 is based on the TI-1200 but includes rechargeable NiCd-batteries instead the standard 9V block battery. To enhance the readability of the keyboard both the size of the numerals and the color-scheme was improved. Disassembling the TI-1205 reveals an internal construction identical with the TI-1255. Instead of the 9V battery found in the original TI-1200, TI-1250 design, the TI-1205 makes use of 2 rechargeable, AA-sized NiCd (Nickel Cadmium) batteries. The PCB (printed circuit board) adds both the charging circuit for the batteries and a step-up converter to generate the 9V supply of the TMS0972 single-chip calculating circuit. Please notice that both the Klixon™-style keyboard and the TMS0972 would support the 4-key memory of the TI-1255. The TI-1205 is by far the most colorful and exotic calculator within the TI-12xx line. Fellow collectors - if you own a Texas Instruments TI-1205 calculator, please report us the serial number and date code from the back of the calculator for our Database. Don’t miss the Spirit of '76 and TI-1260 using the same white color housing. On September 17, 2009 we were able to celebrate reunion of the calculators featured in the TI Learning Center Sales Leaflet CB-272 including three of the rarest portable electronic calculators. TI-1205. Four function capability for upper elementary students. Ideally suited for use with Texas Instruments 4-6 grade level “Elementary Mathematics Concepts with Calculators™” learning kit, the rechargeable TI-1205 meets all the criteria for beginning use of full-function calculators as described in the December 1975 Newsletter of the National Council of Teachers of Mathematics. 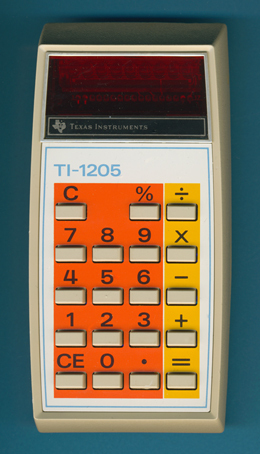 The TI-1205 features a colorful face with large, easy-to-read numerals. A bright, 8-digit display shows calculator overflow indication, and a negative sign, just to the left of displayed numbers. The TI-1205 adds, subtracts, multiplies, divides – all in full-floating decimal. And there’s an automatic constant for multiplication/division of a series of numbers by one number to or from a series of numbers. Algebraic entry lets students enter numbers and press keys as they would write them on paper. Clearly labeled, easy-to-handle keys provide a positive “click” to assure students that a number has been entered. A separate clear entry key lets them clear a mistake without repeating the entire problem. When used in conjunction with 4-6 grade level “Elementary Mathematics Concepts with Calculators”, developed by the University of California ’s Lawrence Hall of Science, the TI-1205 can be a positive force in acquisition of mathematical concepts by upper elementary students.